Normally, I’ll post an image from Christ’s Passion on Fridays. But, because it was Thanksgiving yesterday, today’s art features the Last Supper! Which is also considered a moment that was absolutely critical to the Passion… after all, we do celebrate Holy Thursday during Holy Week, just before Good Friday, and Holy Thursday is all about the Last Supper! Yet, it’s also is related to Thanksgiving (despite the lack of turkey!) because the Last Supper is when the Eucharist was established. And the word “Eucharist” comes from a Greek word “eukharistia” which literally means thanksgiving! Anyway! Here’s an interesting picture of the Last Supper… which also happens to coincide with Black Friday, as it is a very dark image! As usual, click if you want to see a bigger version of the image…. there’s a lot going on! 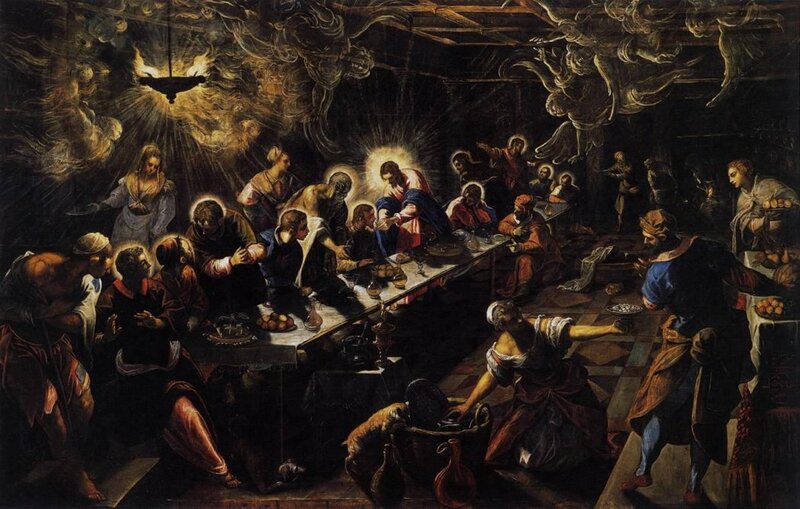 The Last Supper, by Il Tintoretto, c. 1592-94. San Giorgio Maggiore, Venice, Italy. …did I mention this was an interesting picture? This was made during the Counter Reformation, which was an interesting part of the Church’s history. At the time, the Reformation was going ahead with full steam and many Protestant sects were bent on destroying as much religious art as possible, since they viewed the art as being idolatrous. The Church’s response to that iconoclastic movement was to reemphasize the place and importance of religious art. And so they commissioned artists to create these important biblical scenes and transform them into original pieces of art. Yet, they also wanted these biblical scenes shown in different and original ways to reassert the importance of the religious art by causing people to take another look at the art and look closer. And this was the environment that Jacopo Tintoretto found himself in when he made this picture! The painting he did is an odd picture for several reasons! For one, it’s a dark picture, where the only sources of light seem to be emanating from the oil lamp, hung from the ceiling, and Christ’s halo. Christ and His disciples sit on one side of the table, just as many artists portrayed the scene from the early part of the Renaissance, but because of the perspective, other people, including many servants, can be seen as well. This flurry of activity takes away some of the focus away from Christ, yet it makes it a very human experience as well since it seems to be bringing the Church laypeople into the scene as well. Yet, it is an overwhelmingly divine experience as well! The woman washing dishes face is shadowed from the light of Christ’s halo. Angels hover overhead in anticipation of this extraordinary and supernatural event of the Eucharist. And Christ offers the Eucharist to His disciples, placing the Host on the tongue of His disciples in a way that Catholics at the time would immediately recognize as the Eucharist being enacted for the first time. Anyway! I hope you all had a fantastic Thanksgiving! There are a lot of things going on in this artwork. What was the first thing that you noticed? Does it bother you that Christ is not at the center, or do you feel as if this forces you to be drawn into the painting more? The people in this picture seem to be either servers or receivers of a service. Where, in your faith, do you see yourself now? Thank You for giving us the gift of Your Eucharist and allowing us to partake in it. May we worthily partake into Your sacrifice. This is one of the images that I chose for the upcoming book, The Luminous Mysteries, which will come out sometime in 2018! You can take a peek at the first book, The Joyful Mysteries, and/or buy it on Amazon, Barnes and Noble, and Books-A-Million.